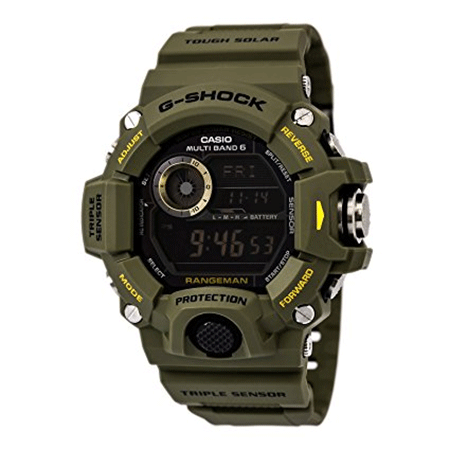 G-Shock watches, created by Casio, are ideal for sports people, military or any person leading an active lifestyle. The watches are designed to operate in harsh environments and as such come with features such as resistance to water, shock dust and pressure. Besides telling time and date, these watches can act as stopwatches, alarm, show tide graph, show temperature, act as a compass, barometer and altimeter and synchronize atomic time. 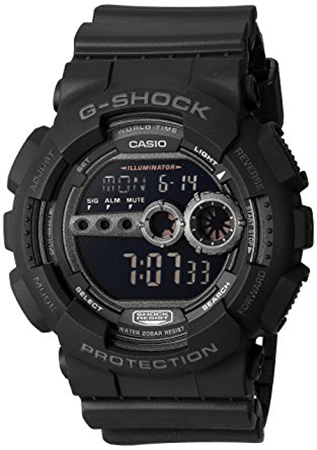 The GD100-1BCR G-Shock Sport Watch is an all-black shock resistant time piece that features automatic LED light and World time. Other features include countdown timer, 12/24-hour formats, five alarms, 1/100 second stopwatch, flash alert, and multi-time. This water resistant watch is ideal for marine activities. The molded resin band is easy on the wrist of the wearer and comes with a buckle for safe closure. Gold-tone subdial is the most impressive and unique feature on this watch. Other helpful features include world time, stopwatch and countdown. Regardless of the size of your wrist, you can still wear this watch because it has an adjustable band. This watch has impressive features including 4 display windows, led illumination as well as 4 alerts every day. 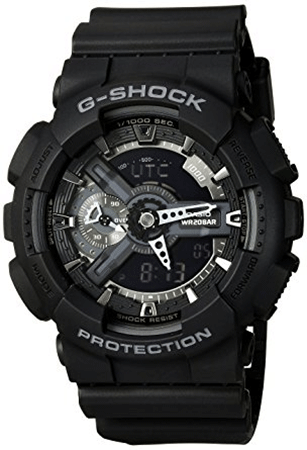 The G-Shock G 9000MS-1CR has a black matte, stealth finish that makes it look trendy. It features hourly time signal, five alarms, auto LED backlight, 1/100 sec stopwatch, countdown timer, 12/24 hour formats. 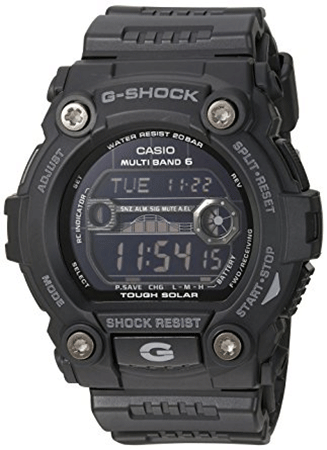 Its resin band has buckle closure, while its quartz movement comes with digital display. It has a multi-display window showing month, date, time and day. If you work in grueling and tough conditions, this rugged and strong timepiece is just what you need given its design and engineering. The Shock Resistant Triple Sensor helps the watch to maintain altitude, direction readings, barometric pressure, and temperature whenever you need to use them. A metal cover is fitted to protect the sensor button from lateral impact and foreign matter. All sensor modes have their own audio tones as well. The impressive watch also entails sunrise/sunset data, one-touch elapsed time measurement, and one-touch time recording. 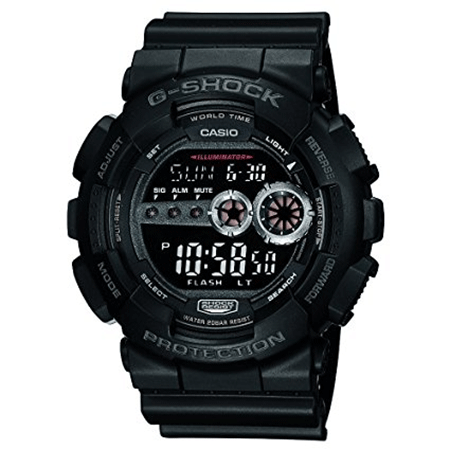 The Casio G-Shock GD -100-1B Watch is large and comes with a wide and all digital face, which shows sturdiness. Its oversize buttons also make it easy for reading time. There is also high-density LED light that lights up its dial face from the back to ensure that the display is clear. The watch features multi-time showing up to four different cities. It also features an auto-calendar, five alarms and 12/24 hour formats. This watch has some amazing features including Multi-Band Atomic timekeeping, tough solar, Triple Sensor (compass, Thermometer an Altimeter /Barometer). There are also sunrise and sunset date, Mb6 atomic timekeeping, time stamp, four alarms, auto LED, 1/10-second stop watch, buckle closure, countdown timer, storage battery and Full auto LED. The battery is solar rechargeable with a power indicator. On full charge, this battery can last up to 7 months. 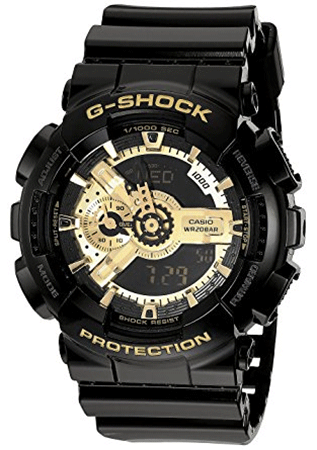 The G-Shock GW7900B-1 is a solar powered sport watch that features atomic time keeping, world time up to 48 cities, 1/100 stopwatch, 12/24 hour formats, EL backlight, 31 time-zones, tide/moon graph, and a calendar among others. Its 50mm resin case and resin band with buckle make the watch elegant and wearable. It has a digital display that is clear during the day as well as during the night. It is offered with Japanese quartz movement which makes it accurate in telling time. 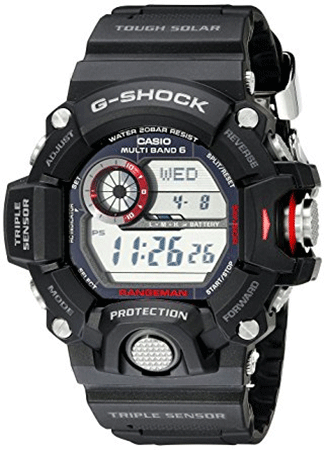 The GA 100-1A1 is offered with all the great features that make G-Shock watches popular among individuals with active lifestyles. It is among other watches in the X-Large series. 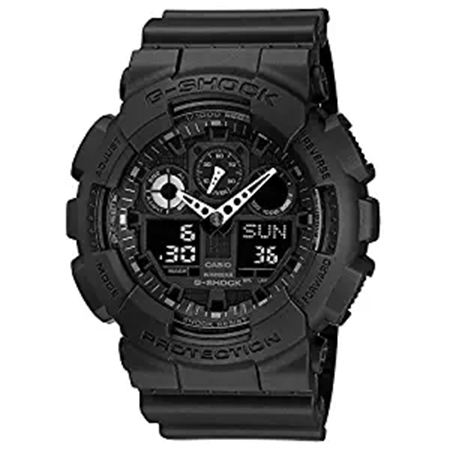 Its matte black resin band makes it wearable while its black face makes the watch camouflage with different settings and gives the watch an elegant appearance. It also features a countdown timer and a 1/1000 stopwatch. The watch’s battery lasts up to 2 years. 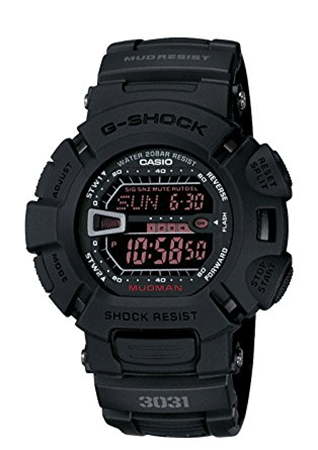 The G-Shock DW-9052-1CCG is a digital watch with a black face and a black resin band. 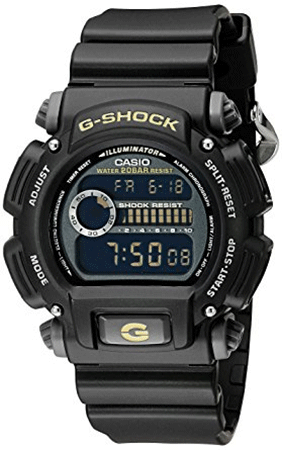 It boasts features such a 24 hour stopwatch, countdown timer and 200M water resistance. People who enjoy daily wear, swimming, running in mud and dirt will really enjoy this watch. It sports a sophisticated design that looks great on the wearer.